I won’t deny that I can be a little complicated. I eat my fries with mustard, never ketchup…unless it’s yellow mustard, in which case I prefer barbecue sauce. I like my wine dry but not too dry. My coffee order? It’s more adjectives than nouns. Basically, eating out with me is kind of a nightmare, with one very important exception: chocolate. When it comes to dessert, I gravitate towards chocolate-centric recipes like this no-bake Chocolate Ganache Tart every. single. time. 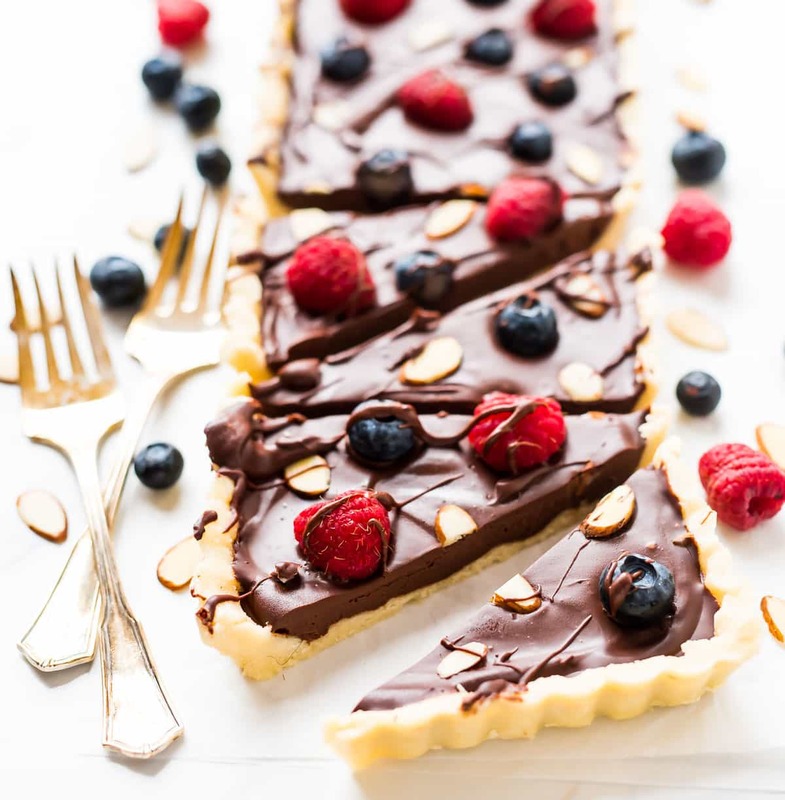 Now, I realize that with its glossy chocolate finish and jeweled berry topping, this Chocolate Ganache Tart looks as complicated as my coffee order, but it is actually one of the easiest desserts I’ve ever made. It’s entirely no bake (both the filling and the crust), the chocolate filling is only three ingredients, and the pie crust is actually a crumble that you press into the pan with your fingers, no fussy rolling or shaping required. 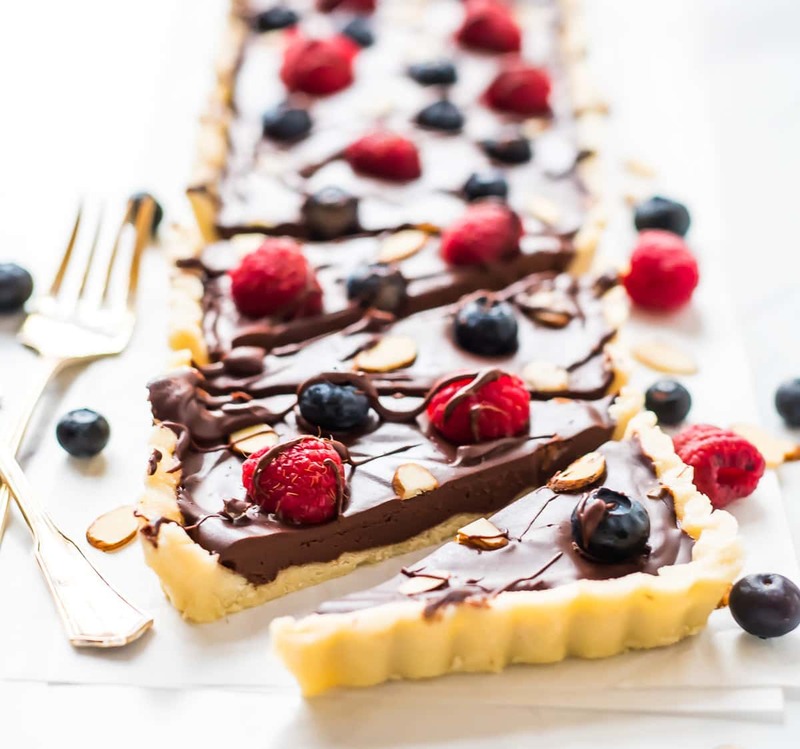 In addition to being attainable for cooks of all levels, this Chocolate Ganache Tart is naturally vegan, gluten free, and dairy free, so it’s also suitable for almost any diet. The chocolate ganache filling is a blend of dark chocolate and coconut milk, the crust is made with almond flour, and the only additional sweetener (aside from the whopping 10 ounces of dark chocolate in the filling) is a bit of agave nectar in the crust. If the chocolate desserts of the world could vote, this Chocolate Ganache Tart would be president. Or at least prom queen. Now, I’ve heard a rumor that Valentine’s Day is coming up (and by “heard a rumor,” I mean I’ve asked Ben at least four times what he thought we “might do for dinner next Tuesday”). While your feelings about this holiday may be complicated, dessert does not need to be. This easy Chocolate Ganache Tart is the proof. (No) bake one for your sweetheart, your sister, your best friend, or for yourself. You’ll be amazed at how a recipe so simple can taste so exquisite. This Chocolate Ganache Tart lasts a few days in the refrigerator, so you can prep it ahead if you like/have enough self control to stay away from it for more than a few hours. It’s also freezer friendly, so if you are serving a party of two and have some slices leftover, you can easily stash them away for a future day of chocolate delight. 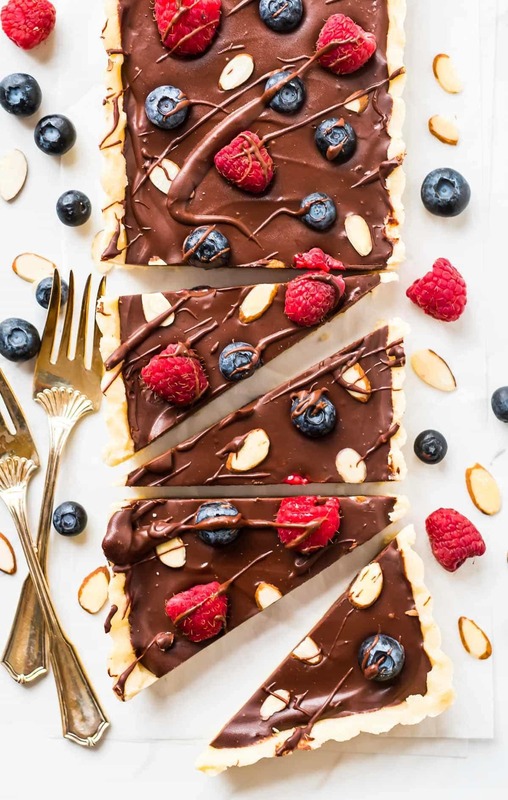 No-Bake Chocolate Ganache Tart. Rich, decadent, and completely vegan and gluten free! An easy dessert recipe that’s perfect for any occasion. Lightly coat a 14x5-inch tart pan with a removable bottom (or a 9-inch round tart pan with a removable bottom) with baking spray. Set aside. For the crust: Place the almond flour and salt in the bowl of a food processor fitted with a steel blade. Drizzle the coconut oil and agave over the top. Pulse until the crust is evenly moistened. If it seems too dry, add a bit more coconut oil. The crumbs should hold together when pressed. Press the crust into the prepared tart pan so that it forms an even layer along the bottom and sides (the crust may not reach all the way to the top of the tart pan). Place in the freezer while you prepare the filling. You can also make the crust 1 day ahead and keep it in the refrigerator, lightly covered with plastic wrap. For the filling: Place the chocolate in a heatproof bowl set atop a pan of simmering water, ensuring that the bottom of the bowl isn’t touching the water’s surface. Once the chocolate is almost melted, remove the bowl from the pan, pour in the coconut milk, then stir until the chocolate finishes melting and the filling is smooth and glossy. Stir in the vanilla extract and instant espresso. Immediately pour the filling into the chilled crust, reserving a little to drizzle over the top. Smooth the filling into an even layer. Decorate with berries and sliced almonds, then drizzle the remaining filling over the top. Place in the refrigerator to set completely, about 4 hours or overnight. When ready to serve, let the tart rest at room temperature for 5 to 10 minutes, then gently remove the tart from the pan. Slice and enjoy. *To make your own almond flour, place 1 1/2 cups slivered almonds (for a white, finer almond flour) or 1 1/2 cups raw almonds (if you don't mind bits of the skin in the crust and a slightly coarser texture) in a food processor fitted with a steel blade. Pulse until finely ground. Do not over blend or the almonds will turn into almond butter. Store leftovers in the refrigerator for up to 5 days or freeze for up to 3 months. Let thaw overnight in the refrigerator. Will All Purpose flour work? I assume you used almond to make it gluten free, or is there a flavor component as well? Hey girl- this tart looks so tasty! Have a great weekend! Thank you so much, Shawnna! I hope you had a great weekend too. Tart looks luscious! Can I substitute cream for the coconut milk? Thanks! Hi Susan! Yes, that will be fine. I hope you love it! This looks great, Erin- may try it for tomorrow night! Love the styling/gold flatware in the photo too! I hope you love it, Georgia! Thank you so much! Erin, this tart looks sooo pretty! :) And it’s no bake! What a great recipe! 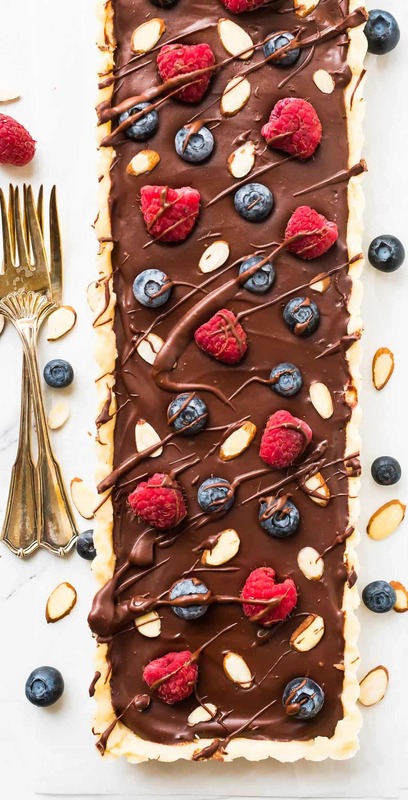 This tart looks SO beyond delicious – and a little secret, I don’t even *love* chocolate, but I’d devour this right away. This is beautiful!! I may have to start experimenting with almond flour. Thank you so much for this recipe! I have a friend with a very restrictive diet and all of the ingredients in this tart were things he could eat, and it came out really well! It is very rich but that’s because it is a chocolate ganache tart… so rich in a very good way :) I think the crust definitely helps to balance out the chocolate. Will definitely be making this again! Ankita, I am SO happy to hear this! Thank you so much for letting me know how it came out and taking time to leave this lovely rating. Looks great and can’t wait to make this! I haven’t seen any coconut milk that sells full-fat what brand did you use? Hi Hannah, I usually get Thai Kitchen, and I’ve also used Trader Joe’s. I believe many brands have full-fat versions—they’re also sometimes labeled “regular” or “classic.” Good luck on your search! Hi Erin, this recipe looks great, I will be making it this weekend for sure! I have a few questions though: What are your thoughts on swapping coconut oil for unsalted butter, thoughts on swapping coconut milk for full fat milk or heavy cream? And have you tried baking the crust? I’m just a little bit scared about all the coconut flavors as my husband does not like coconut. Hi Carolina, yes, I think you can swap butter and heavy cream (but not whole milk). The crust isn’t intended to be baked, so if you prefer to have a baked crust, I’d use your favorite crust recipe instead. I hope you enjoy the tart! Finally made this tart. The only change I made was I used heavy cream instead of coconut milk. It turned out great!! Everyone loved it and I will definitely make it again. Thank you, Erin!! Hooray! Thanks for reporting back, Carolina! Can I make this in a 9×9 pan and cut into bars? Will the ratios still work? Hi Molly! A 9×9 pan has a bigger area than a 14×5 or 9-inch round tart pan, so everything will be thinner. You may want to make a little extra crust and filling, as the layers are already fairly thin. You also might have a little more trouble removing the bars from the pan, since the removeable-bottom tart pans really help with this. If you decide to experiment, I’d love to hear how it goes.